n Monday, Jan. 2, Shaker Sister Frances Carr died at the age of 89. She had been a Shaker for almost 80 years and passed away at the Shaker community at Sabbathday Lake in Maine. Through my own research interest in the area of Christian rituals, I have developed an interest in the Shakers and Shaker history, especially related to the “Era of Manifestations” in the mid-19th century. That was the period when the Shakers performed elaborately choreographed forms of ritual dance and sang sacred songs during their Sunday worship (usually open to the public). And so it was with a pang of sorrow that I read Sister Carr’s obituary. She had been a member of the community since 1937, when the Shakers (who called themselves the United Society of Believers in Christ’s Second Appearing) had taken her in as a 10-year-old orphan. According to one point of view, Carr was the last Shaker. In the mid-20th century, as the number of Shaker villages dwindled to two (Canterbury in New Hampshire and Sabbathday Lake in Maine), members of the Canterbury group felt strongly that the church should be allowed to die out. They insisted that Shaker membership had been closed since 1965 and that no new members would be accepted by either remaining Shaker community. Regardless of which side one might take, the death of this “last” Shaker is at least the symbolic close of an era. At one point in time, Shakers were quite a notable element in the religious and cultural life of United States. Even today, from my perspective, Shaker insights and way of life have much to offer. To begin with, the “Society of Believers” grew steadily in the United States from 1774, the year their founder, the English visionary and preacher Mother Ann Lee, arrived in New York with a few of her followers. 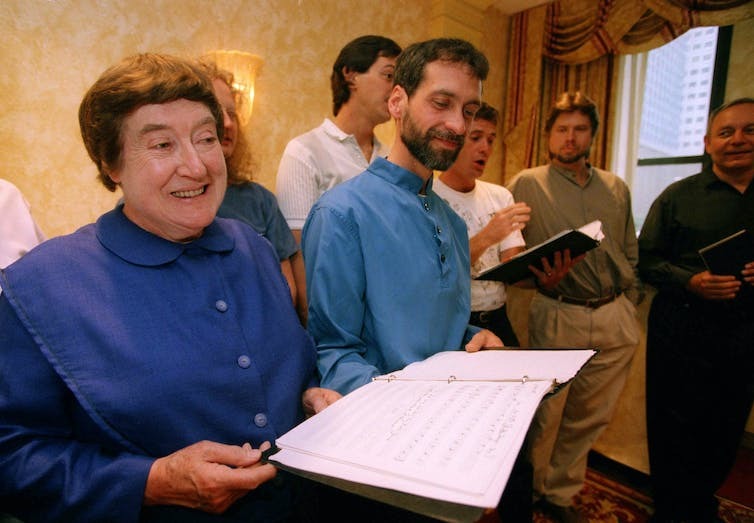 At first met with some resistance and even violence, Mother Ann started public preaching, prophesies, and Spirit-inspired singing and dancing. She insisted that Christ had already returned “in glory” from the dead, as he had promised in the gospels. She urged those who accepted this truth to respond by confessing their sins and then gathering together to live new lives in more perfect societies. 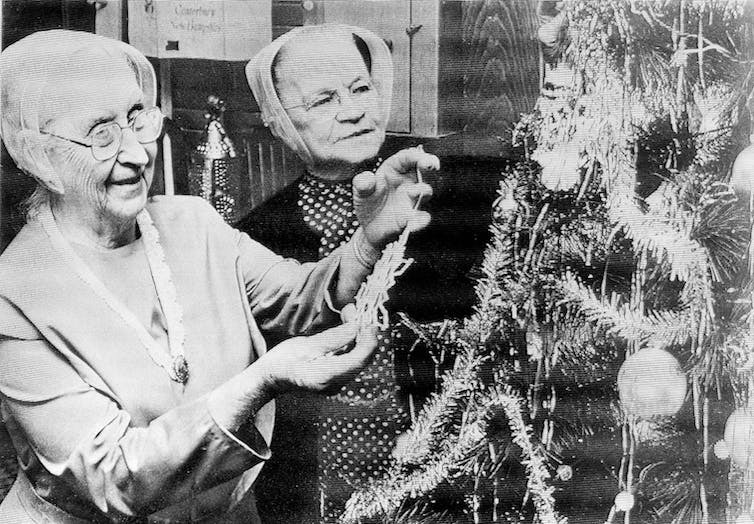 A Dec. 23, 1978 photo of Eldress Bertha Lindsay, left, and Gertrude Soule decorating their artificial Christmas tree at Canterbury, New Hampshire. Believers dissolved their marriages in order to live in communal villages, practicing strict celibacy as “brothers” and “sisters.” Those who had children allowed them to be raised by the community; they also took in orphaned and unwanted children. They held all of their goods in common, made their own clothes, constructed and invented their own tools and architecture, and lived their days according to a specific order in work and prayer. Apart from one urban community in Philadelphia, composed largely of African-American Shaker women, Shaker villages were agricultural communities, self-sufficient for the most part, supporting themselves by selling their produce and crafts. Most notable of these were packaged seeds, a joint venture of several Shaker communities marketed as the Shaker Seed Company. Against this backdrop, many elements of Shaker life seemed at best antiquated (for instance, their determined rejection of “the world”) and at worst repellent (especially their insistence on mandatory celibacy). The number of aspirants wishing to join dropped and people began to leave Shaker communities. The remaining Shaker population was rapidly aging. Slowly, Shaker village after Shaker village closed and the land was sold to local towns or private individuals. One example is the Shaker village in Shirley, Massachusetts, which was repurposed as a boys’ reform school for decades (1908-1972); some of the land was then used for a new prison. 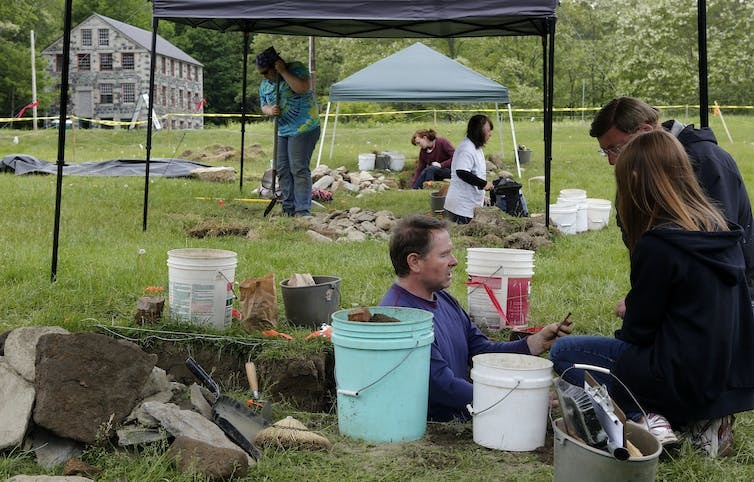 A June 8, 2015 photo of an archaeological dig at the Shaker village in Enfield, New Hampshire. Sections of 15 others, including Sabbathday Lake, were preserved as historical sites through the National Parks Service, and are still open today for tours and workshops. A few Shaker songs, originally used during ritual dances or prayer services, survive in folk and classical music such as composer Aaron Copland’s “Appalachian Spring.” One, “Simple Gifts,” is still taught and sung in schools, churches and by professional musicians. Today, most people use the term “Shaker” in the same way as they would “Amish,” as an adjective designating a simple, “hand-crafted” style of design in clothing or furniture, like Shaker sweaters or Shaker furniture. But regardless of whether or not the Shakers’ actual communities survive the 21st century, many believe their influence has shaped and will continue to shape American thought and culture in more than one way. Members of the society, for example, were early proponents of gender equality , based on the fundamental teaching of Mother Ann that all believers were radically united in Christ’s second coming (not without some internal struggles on how that should be best expressed after her death). Christ was already present, they believed, within each of them and among them as a community; therefore, harmony was a key element in the structuring of all Shaker communities. Teams of both sisters and brothers served in leadership roles as Elders and Eldresses, and Mother Ann continued to be the touchstone figure for all of the communities. Narratives about Mother’s life, words and actions, collected at various points during the Shaker experience, continued to highlight her venerated position as suffering woman, formidable prophet and spiritual mother. Believers were also determined pacifists, holding that warfare was antithetical to true Christianity. Throughout the history of the United States, they refused to serve in the military and protested against conscription. During the Civil War, they were among the first groups to receive conscientious objector status or an official exemption from military service based on their religious beliefs, along with the Quakers. Members of the society stressed a simplicity of lifestyle, expressed in a strong sense of responsibility and adaptability in their daily actions and decisions. They accepted both “science” and “religion” as part of God’s truth, and so never rejected technological advances, just the materialism that tended to come with them. They abhorred waste. Visitors and guests at mealtimes were reminded to “Shaker their plate” or to take what they wished but leave no uneaten food on the plate. Shaker buildings were simple but practical; furniture was plain but sturdy, and designed for convenient storage. Believers were considered to have “well ordered” farms, and were efficient and “scientific” in their methods, not afraid to adapt their methods to differences in agriculture in different states and environments. Certainly, there are elements of the Shaker gospel and “harmony” that simply do not carry over into the 21st century, such as the insistence on mandatory celibacy for all members or the expectation of visions from diverse spirits. But Shakers’ rejection of “the world” does offer us today some insightful reflections on contemporary issues such as their pacifism when confronted by terrorism; their mutual love and respect in the face of gender and racial divisions; and their cheerful blending of prosperity and simplicity as a response to the wasteful nature of many materialistic cultures. Marked as it may be by sadness, perhaps their inevitable individual “death” is necessary in order to reach their fullest bloom and bear their richest fruit within the culture that survives them and cherishes their memory. Their vision of a human society united in harmony with one another and with the natural world can offer many lessons.